5 km from Vinci: Villa Santa Maria located on a hillside 5 km from the town of Vinci, the birthplace of Leonardo da Vinci. The villa, restored and delicately furnished, is surrounded by the park immersed into olive trees. Villa "Santa Maria", 350 m a.s.l., detached, surrounded by trees and meadows. 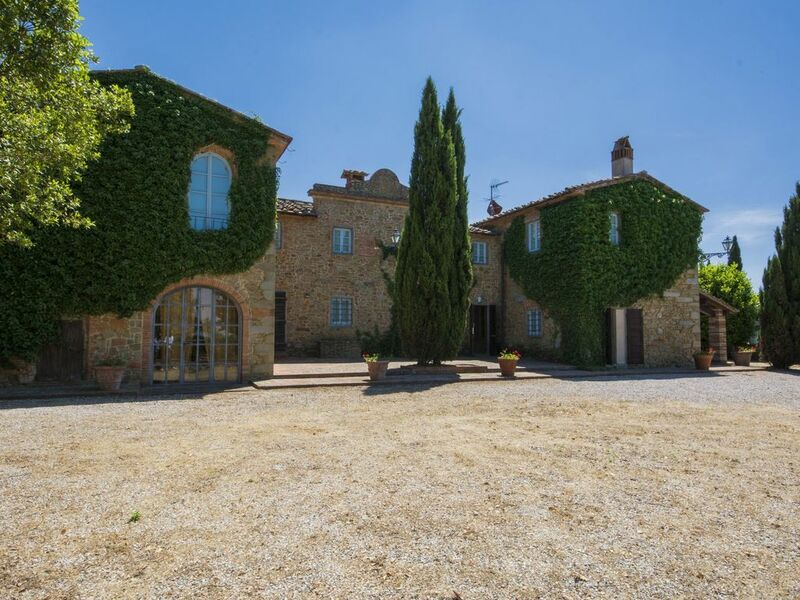 5 km from the centre of Vinci, 40 km from the centre of Firenze, 50 km from the centre of Pisa, in a quiet, sunny position on top of a hill, 50 km from the sea, in the countryside. Private: garden 1 ha (fenced), swimming pool (10 x 6 m, depth 120 - 160 cm, 02.05.-26.09.). Outdoor shower, pool house, table tennis, garden furniture, barbecue. Heating to be paid on the spot (01.11.-15.04. ), heating available only from 01.11. to 15.04.. Room cleaning weekly (included). Narrow motor access to 300 m from the house. Parking on the premises. Shop 5 km, grocery 1.5 km, supermarket 5 km, sandy beach "Viareggio - Forte dei Marmi" 75 km, thermal baths "Montecatini Terme" 25 km. Golf course (18 hole) 10 km, tennis 15 km. Nearby attractions: Carmignano 15 km, San Miniato 15 km, Montecatini Terme 25 km, San Gimignano 45 km, Volterra 60 km. Please note: suitable for families. "Villa Santa Maria", 8-room villa 380 m2 on 2 levels, on the ground floor. Very comfortable and tasteful furnishings: entrance hall. Living room with open-hearth fireplace. Living room with satellite TV and flat screen. Dining room. Kitchen (5 hot plates, oven, dishwasher, microwave, freezer) with dining table, open-hearth fireplace. Sep. WC. Upper floor: small lounge. 1 room with 2 beds and air conditioning. 1 room with 3 beds and air conditioning. 1 double bedroom with air conditioning. 1 room with 2 beds, separate WC and air conditioning. 1 small room with 1 bed. Shower/bidet/WC, bath/shower/bidet/WC. Heating, air-conditioning (extra). Large garden. Barbecue. Panoramic view of the countryside. Facilities: washing machine, children's high chair. The third bed in the room is located in a gallery with a height of 80 -110 cm, with access from a small ladder. Es una casa muy adecuada cuando hace buen tiempo, pero la primera semanade junio hizo bastante frío y la casa resulto húmeda y con poca provisión de mantas.